This is the first of the South African issues: Gibbons lists eight issuing entities (Cape, Griquland West, Natal, New Republic, Orange Free State, Transvaal, Zululand and British Army Offices) before the formation of the Union of South Africa in 1910. The Cape is famed for its first issue, 1st September 1853, the world’s first triangular stamp. I have a rather mean, marginless Cape SG1 and so also include a bold 1953 commemorative. Mackay identifies a 1900 Cape commemorative which I thought, at first, might be the Mafeking Besieged overprints, but on reflection must be the quaint pair of local designs showing Cadet Sgt-major Goodyear on his bicycle (British Kaffraria SG17-18) and a portrait of General Baden-Powell (SG19-22): these are expensive and unlikely to be commemorated for the same reasons as India’s #1. 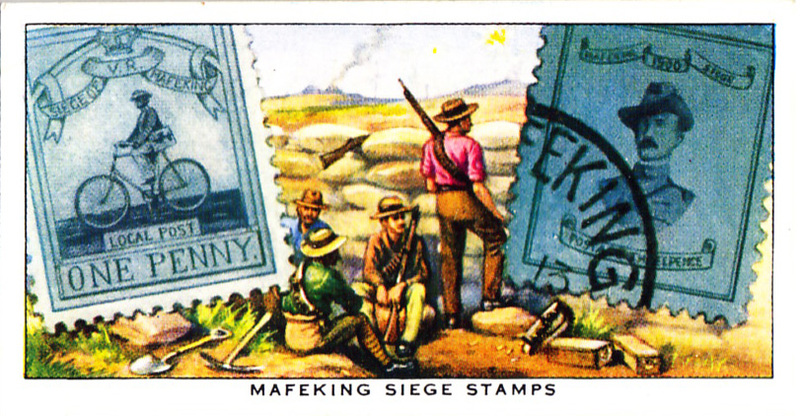 [Note August 2013] Bizarrely, they were commemorated in 1982 by St. Thomas and Prince Islands, which clearly regards stamps as a money-making export rather than small pieces of sticky paper to put on letters. Buying such stamps will only encourage their excess, but in this case I will make an exception to serve the higher purpose of the project. 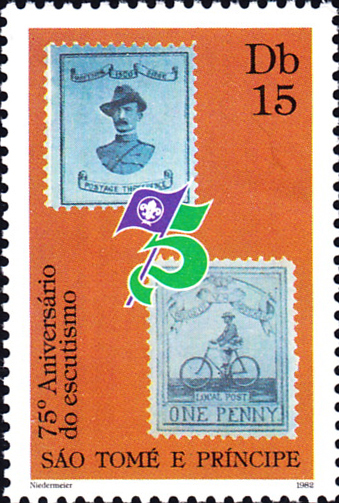 One of the stamps also featured on the front cover of the 2007 edition of Scott Classic (they are all shown here). [Note Feb 2014] While looking for the ST&PI commemorative, I have found a splendid source of substitutes in the 50 card series issued in 1939 by the Ardath Tobacco Co, including a card. no. 7 for the Mafeking commemoratives. More on finding substitutes here. [Feb 2016] St. Thomas & Prince Is. commemorate added. Tasmania’s first stamps (1st November 1853) were issued in the name of Van Diemen’s Land, the name changing to Tasmania with the 1858 SG40, Sc14. Both firsts are expensive and so the FSPs (first sensibly-priced) stamps are shown, together with a 1953 commemorative. Western Australia, the fourth Australian State to issue, started with the magnificent black swan on 1st August 1854. My example is rather less than magnificent but the 1954 commemorative makes up the deficiency.